Perfect Picture Book Friday/ What’s Under the Bed? Yep. I found another great book that’s not on the list. Susanna’s list that is. Not only is this review part of the Cheerios first Author Series, it is also part of Susanna Hill’s Perfect Picture Book Friday list of recommended picture books with resources. On her blog she has many books that come with a recommendation and review along with resources for activities and discussion for parents, teachers and others looking for help picking out a book and maybe looking deeper into it with resources. And as far as the First Author Series go I have collected books from Cheerio boxes on the Spoonful of Stories Program where the author is a first time published author and a winner of the contest.For the next several weeks I will feature one of these books. And the next two Tuesdays I will be featuring the 2010 winner of this famous contest, Ron Rauss in an interview. So be sure and tune in to read about it. Title: What’s Under the Bed? 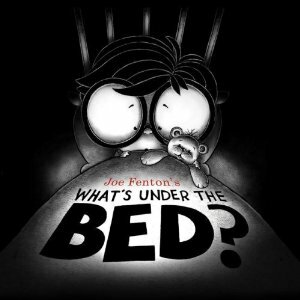 Summary of book: When Fred goes to bed he thinks there is a monster under the bed but after freaking himself out and he gets the courage to look he finds out it is only his Ted. Why I love it: Because it is a monster book in disguise! This is an endearing look into a child’s mind when he gets scared at bedtime. It’s simple with one sentence a page. And the illustrations are imaginative creations in black and white with only an accent of red. you’d like to be whisked away through cyber space to the resource page and the list of more marvelous recommended perfect picture books just click on the perfect picture book badge on the right. This entry was posted in blogging, Clara Bowman-Jahn, Clarike Bowman-Jahn, Course or Book Review, social networking and tagged Perfect Picture Book Friday, Picture book, Simon & Schuster, Susanna Leonard Hill, What's Under My Bed. Bookmark the permalink. 24 Responses to Perfect Picture Book Friday/ What’s Under the Bed? Great selection Clair! Realistic for children who are fearful about what may be under their bed. Nice to find it isn’t a monster, but his friend. Nice resources. Love the cover. I am putting this on my list. I can never get enough of monster books! The illustrations look fabulous. I have a little one who is afraid of bedtime right now. He always has to bring several toys to bed “to protect him.” I think he’d like this book. Tell him to make ‘friends” with his monsters. It’s a psychological technique that really works. That’s a great idea, Clar. We’ve been reading some fun, friendly bedtime monster books, so hopefully friending will help. 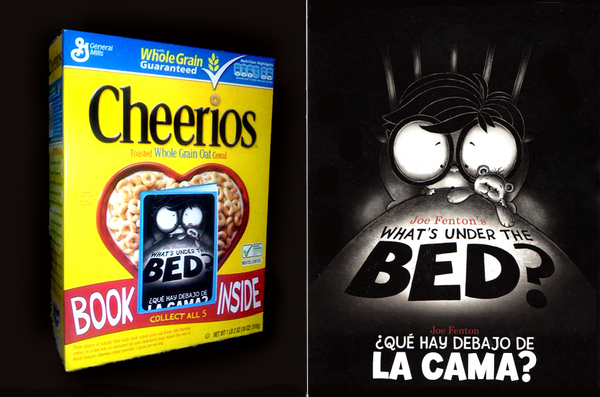 Love this choice, and can’t wait to see the other “Cheerios” selections! Monsters under the bed are a classic! Great choice! There seems to be a monster theme this week! This looks like a great monster book – thanks. I haven’t seen this one. Looks like a winner! Thanks for sharing yet another great monster book! great review and highlights for children’s authors…what a great resource. That looks like a good book for children who are scared of a monster under the bed. Kids like fun rhymes like that. Thanks for sharing!